Viktor grew up in the Core worlds. It was not until his adult life that he picked up an education in slicing and smuggling and relocated to the Outer Rim to make a career of these skills. Viktor has the uncanny gift of fitting in and getting on with people from nearly every walk of life. He naturally blends in with the outlaw crowd. This talent served him well in his career as a slicer in the Outer Rim. 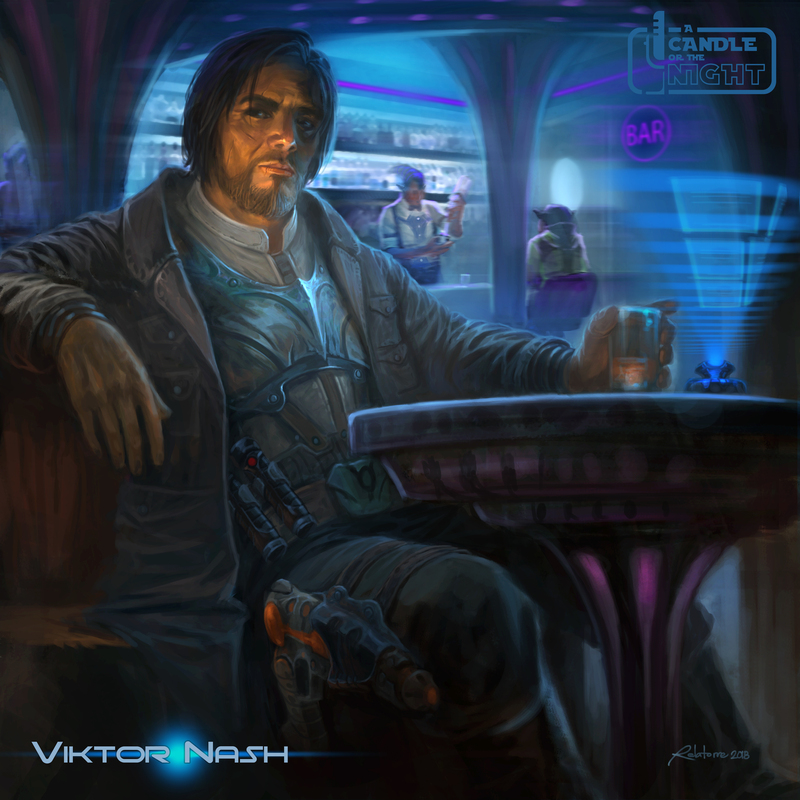 Viktor had always been fascinated by complex networks, artificial intelligence systems, and computers. He is a very self-taught and practiced learner. Through careful study he became adept at slicing and this became his mainstay skill which earned him a secure spot on most captains ships. Every heist or caper needs a good slicer and thus he became the go-to guy among anyone running a high profile job in the Outer Rim. He is a man with contacts in various systems and he has been hired by a variety of crime lords, thieves, and shady dealers. His natural tendency towards blending in makes it easy for him to disappear in a crowd. He flourished in the Outer Rim operating a Black Market intelligence brokerage and developed a reputation for being the premiere guy to reach out to for underworld connections. Had a job and needed a team? He always knew the top specialists to bring to the table. It was in this context that he first met Jensa. Vik and Jensa had been on several crews together and run various jobs. His most recent job involved smuggling contraband on a ship which Jensa piloted. Upon investigating the cargo which they were not supposed to look at, they came to realize they were actually smuggling Force Sensitive children. This was a line that the two of them were not willing to cross. They conspired together to sabotage the operation. After locking themselves in a secure area of the ship and securing the children, they raised the alarm and lured the rest of the crew to the cargo bay. When the crew arrived, they vented the chamber and blew them out into space. After securing safe passage for the children with trusted contacts, Viktor and Jensa developed a new sense of trust. They confided in each other about their bizarre dreams and were shocked to discover they had each had the same visions. This solidified their resolve to pursue this lead and they arranged passage for the Ruuria system, which is where they converged with the party and met their Destiny.